Summer is in high gear, and America’s 236th birthday is coming up. So give three cheers for the red, white & blue! Don't wait to order your Classic and Petite Glory Shells before they sell out too! 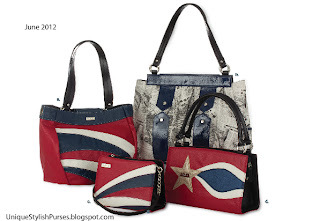 Miche’s patriotic-themed “Glory” Shells, available in three sizes and two fashion-forward designs. And Cindra for Prima Bags is certainly “newsworthy” too with her unique attention-getting look. Available in very limited quantities; So shop early!